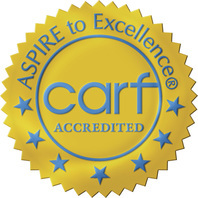 We are proud to be a CARF accredited service provider! CARF International is an accrediting body whose mission is to promote the quality, value, and optimal outcomes of services through a consultative accreditation process and continuous improvement services that center on enhancing the lives of persons served. Achieving accreditation for our organization requires that we maintain our commitment to quality improvement, a focus on the unique needs of each person that we serve, and a strategy to monitor the results of services provided. In this way we are able to continuously enhance the quality of our services and programs to best meet the needs of the people that we serve. Our most recent Survey was completed in March, 2016. Here is a summary of their findings. "On balance, it is evident that The Life Enrichment Center provides excellent services to the persons served and is dedicated to ongoing quality improvement. The organization is respected in the community. The referral sources, persons served, and their families all express satisfaction with the services provided." "THE LIFE ENRICHMENT CENTER IS A VALUABLE RESOURCE FOR MILLEDGEVILLE AND THE SURROUNDING AREA. IT ENJOYS A POSITIVE REPUTATION IN ITS COMMUNITY AND WORKS TO ENGAGE THE COMMUNITY IN APPROPRIATE WAYS. THE COMMUNITY PARTNERSHIPS IN WHICH THE LIFE ENRICHMENT CENTER ENGAGES HAVE RESULTED IN A SUBSTANTIAL NUMBER OF OPTIONS FOR THE CONSUMERS." Read the full 2016 Survey Report here.